This product falls into that Best Buy category occupied by items that are just plain better than they need to be at no additional cost. 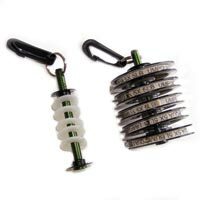 The Mayfly Tippet Post ($9) is a very straightforward object: it’s a machined aluminum rod that you run your tippet spools onto, which then keeps them organized and allows them to spin. It’s a huge improvement over older versions which were made of string (which sagged) or covered in rubber tubing (which bound the spools), or (worst of all) just having a different pocket for each size of tippet. Usually, I wind up leaving the little dangly gadgets like this at home, because they’re often more complicating than simplifying. But this is one of the few “accessories” I can’t live without. A simple clip allows you to move your tippet quickly from bag to bag. Most tippet spools now come with sliding dispenser bands (or you can purchase aftermarket versions). By keeping everything organized, you always know your 6X from your 5X without looking, and you don’t have to worry about juggling or dropping one of those little spools in the river. The anodized aluminum rod has been completely corrosion-resistant for several years of fresh and saltwater use. I keep one Tippet Post stocked with 0X-7X for trout fishing, and another with 10 lb. through 35 lb. saltwater spools. I also leave the separator disks at home, so my spools lock together (which keeps them from rattling). Have a Best Buy nominee? Let us know in the Comments section!